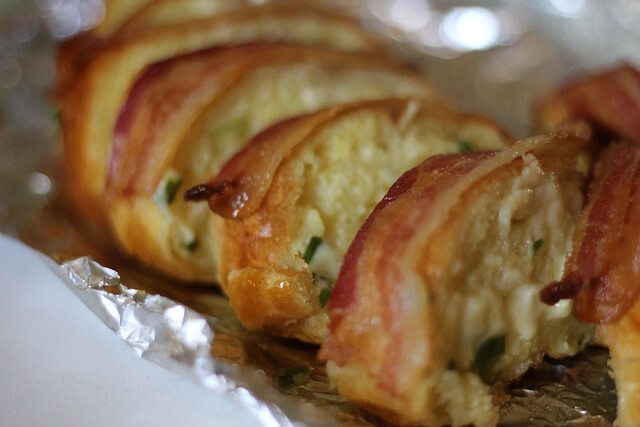 Ooooh I love a good cheesy garlic bread, but I also love bacon....like really really love bacon. Have been meaning to try this bread for a while but just never got around to it, until tonight. I figured it was the perfect pairing to my Savory Beef over Noodles. I made a big 20 inch french bread loaf, but froze half of it for another meal as it would be just too much for our family of 4. Cut bread into 1 inch slices, leaving slices attached at bottom. 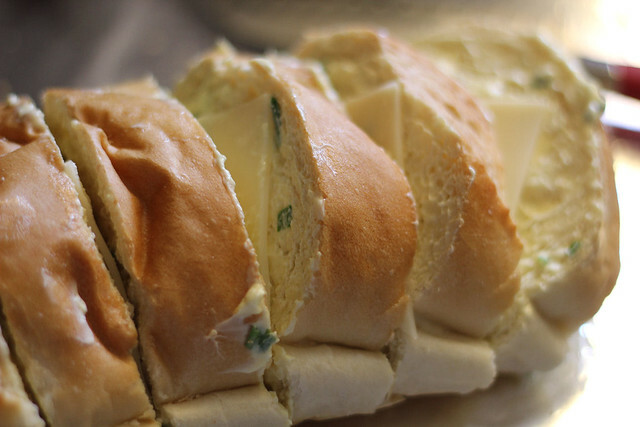 In a bowl, combine butter, onions, mustard and garlic powder; spread on both sides of each slice of bread. Cut each slice of cheese diagonally into four triangles; place between the slices of bread. 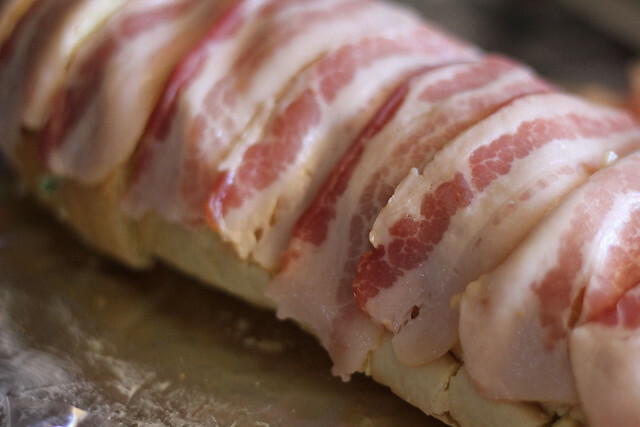 Cut bacon in half widthwise and then lengthwise; drape a piece over each slice. Place the loaf on a double thickness of heavy-duty foil. 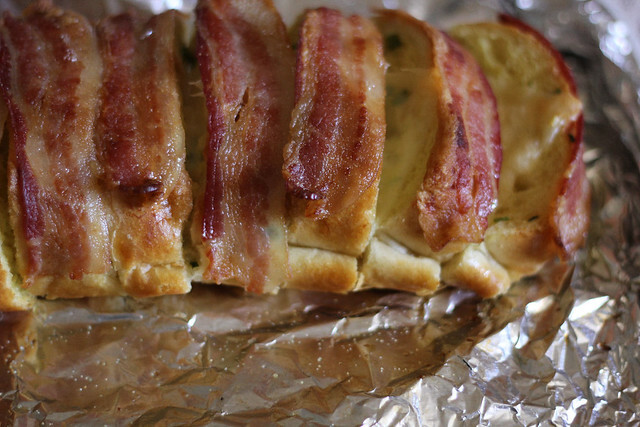 Bake at 400 F for 20 to 25 minutes or until bacon is crisp. If you're freezing for later, prepare as above, then wrap tightly in foil and freeze. I don't know exactly how long it will last, I'm assuming as long as normal frozen garlic bread. I will be using mine next week when I make another pasta dish so it won't sit in the freezer for too long. Bacon on bread!? Is there anything better!!?? I should think not!! YUM!!! lol! Oh my....GOODNESS!! 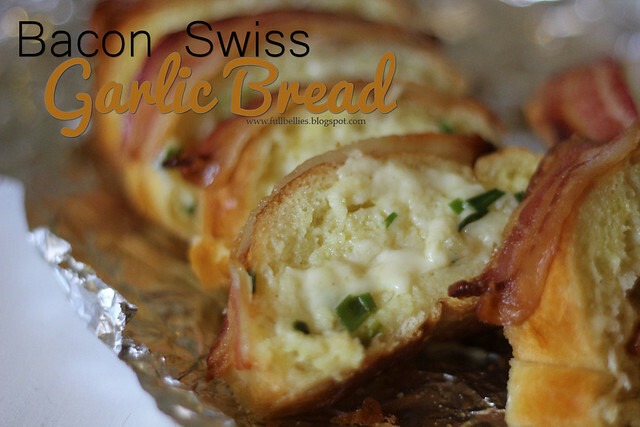 Yum :) So funny, I bought bacon and swiss at the store today not knowing how I was going to use it, just to have on hand. Now I know! Thanks again Sandra!